After quitting my lovely job as a Craft Editor and moving back to my hometown, one of my biggest challenges was NOT to work my hiney off for 60 or more hours per week. My family had gotten into a groove of go, go, go, and that's one of the big reasons we moved (along with many other carefully thought-through little reasons). I have personally always been goal driven and like my schedules and to-do lists. After we moved, my main focus was not on the same set of tasks as before, no, my main focus changed drastically to being a full-time wife and mommy and a part-time everything else - quite the flip flop of roles. Don't get me wrong, I am absolutely grateful for the change and our move back to my hometown roots, but I am hardwired to achieve, mark things off my checklist and follow a plan to reach a recognizable goal. Yes, call me a mega geek. It is who I am and I'm okay with that after many years of trying to understand my nature. However, it has been one of my greatest challenges and, at the same time, wholly freeing, to not let that part of myself take center stage anymore. Sometimes I believe God calls us to step outside of our comfort zone because He wants to bless us with our heart's desires that we may not (usually do not) fully understand. That is certainly where I am now. When the volunteer opportunity arose for me to get back to my creative roots as a designer, I naturally jumped at it as that's who I am comfortable with being, and it has been good for me to have a little of that back in my life. In fact, very good for me to enable a little bit of that hardwired, goal driven nature again and realize it is useful in all areas of my life. I'm thankful for the blessing of offering up my skills at my daughter's new school - making up a couple of their bulletin boards throughout the year as well as pitching in on helping with some graphic design projects like their newsletter (yes, long ago in a far away place, I was actually a graphic designer - I know, *gasp*, right!? ha!). I am also thankful that God knows what good timing is concerning my needs for nourishment in all ways. 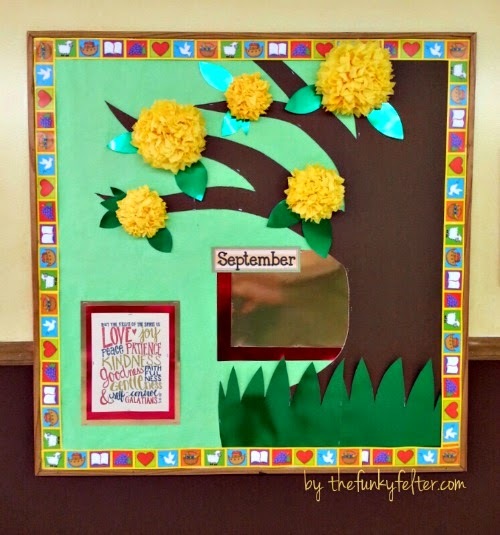 The Fruit of the Spirit bulletin board above sits in the school's main hallway and showcases students throughout the year who portray the Fruits in their lives. I had way too much fun designing and physically making the pieces. It was very good for my soul. Volunteer work is not only done for others, but also benefits ourselves in many heartfelt ways - a complete win/win! The beautiful Galations 5:22-23 printable can be found here for free to download in both color and black/white from Beautifully Rooted - a neat site to explore on its own. I really appreciate the freebie from there! It made my bulletin board shine as it would be nothing without the verse itself to showcase. I printed the color version on tan card stock for my display. And, for those bright, bold tissue paper flowers, you can find the craft tutorial here. 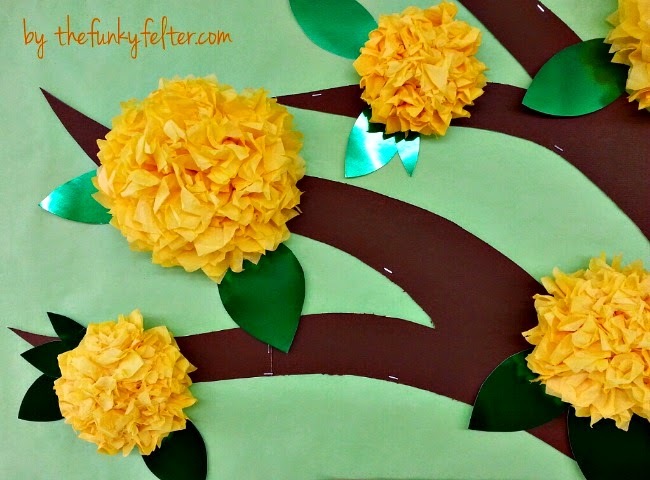 They are soooooooo easy, you can make a bunch at once to accent a bulletin board, party or your home. If you have the opportunity to give of your time and talents somewhere in your community, I highly recommend it. Not only for the community's needs, but also for your own good. Happy crafting!